Baked sweet potatoes make the perfect side to serve with this out-of-the-ordinary, yet oh-so-delicious, grilled meat. Blend barbecue sauce, chipotle pepper, lime juice and half the cilantro in blender until smooth. Reserve half the barbecue sauce mixture for later use; brush remaining barbecue sauce mixture onto meat. Sprinkle with black pepper. Grill meat 15 to 20 min. or until done (160ºF), turning and brushing occasionally with reserved barbecue sauce mixture. Garnish with remaining cilantro. 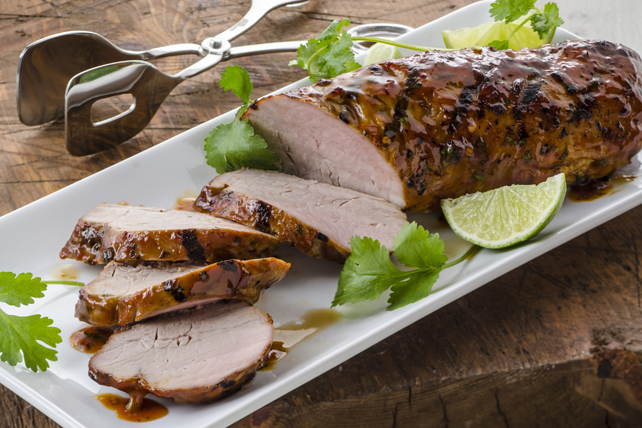 Serve with lime wedges for squeezing over the cooked meat. Substitute orange juice for the lime juice and/or fresh parsley for the cilantro.